In the fifteenth century many of the finest artists' prints were published in bound volumes as suites or illustrations for printed texts. This was especially true for woodcuts, and this volume contains one of the most beautiful and important series before Albrecht Dürer's Apocalypse, 1498. The 95 hand-colored woodcuts illustrate and interpret a popular meditation on the life of Jesus written by a Carthusian monk, Ludolph of Saxony (d. 1377). This edition was published in Ulm in 1482 by one of the foremost practitioners of the new art of printing from moveable type, Johann Zainer. The woodcuts were designed by at least five different artists, but the great majority by only two. Ludwig Schongauer (1450/1455–1494), the brother of Martin Schongauer, the greatest engraver of the period, designed 35 of the images in this volume. Despite the miniaturistic details of his woodcuts, his slender, courtly figures have alert expressions. Extensive parallel hatching with multiple patterns of length, curvature, and inclination creates three-dimensional modeling through the careful control of the fall of light and shade. Ten of Ludwig's designs are partially or wholly related to Martin's engravings. 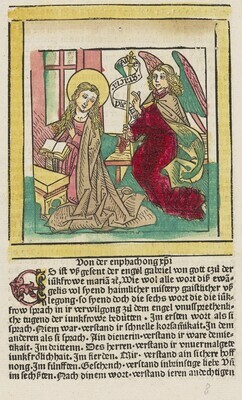 Yet these 1482 woodcuts by Ludwig were in some cases published before Martin's related engravings. Thus Ludwig clearly had access not only to his brother's published engravings but also to preparatory material, perhaps even works he drew himself. Independent of his brother, Ludwig was a fine and creative artist. With remarkable understanding he linked three of Jesus' parables about God's desire to save the lost soul: in a single image he combined the stories of joy at finding the lost (prodigal) son, the lost sheep, and the lost coin. The name of the second major artist, who designed 39 woodcuts for this book, is not yet known, but the quality of his work is extraordinary. This second artist shows broader, more substantial figures with impassive faces, using an open style that evokes the simple outlines but intense religious images of the romanesque. Forgoing hatching, he spaces out single lines but draws them with amazing variety, inflection, and subtlety to capture dramatic gestures (the bride at Cana, for example, tenderly touches her husband's shoulder); wide variation in the folds and fall of drapery; patterns of texture in cloth, fur, hair, and skin; and numerous acutely observed details—a wrinkle in the tablecloth, ties holding window mullions, differences in the texture and arrangement of hair on men of different ages, the puffed-out cheeks of flutists. All these contribute to the sophisticated verisimilitude of his images. In addition to such subtlety of style, this second artist shows extraordinary imagination and invention in his images. To be sure, he portrays many traditional scenes such as the wedding at Cana, Jesus' entry into Jerusalem, or Jesus washing the disciples' feet. As Rembrandt did much later, however, this artist read his Bible very carefully and with a humanistic understanding. From the texts he created many new images not shown in previous art. He was especially creative with images drawn from Jesus' ministry and his parables. Just to name a few, here are what appear to be the first images of Jesus teaching the apostles the Lord's Prayer; Jesus with the rich young man desiring to follow him; the parable of a camel going through the eye of a needle; the example of the child; and the parable of the widow's mite. This volume is crucial for the Gallery's portrayal of the developing art of the woodcut. Its proper attribution and importance have hardly been recognized or studied, possibly because it is so rare, this being the finest of only 7 copies in North America. Thus, in every way, this acqusition represents a wonderful opportunity for the Gallery to continue expanding its acquisitions of major artistic series of early woodcuts. Librairie Thomas-Scheler, Paris, 1926; Private Collection, France, and by descent until 2008/2009; Jörn Günther, Hamburg, Moosboden, 2009; purchased 2010 by NGA.